Black Cherry Garden Services are specialists in removing this highly invasive and destructive weed. Over recent years Insurance companies and Mortgage lenders will often refuse to insure or lend when it is present on a property. We can get rid of it once and for all by injecting each stem individually. 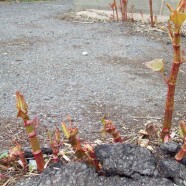 Japanese knotweed spreads through its crown, rhizome (underground stem) and stem segments, rather than its seeds. The weed can grow a metre in a month and can cause heave below concrete and tarmac, coming up through the resulting cracks and damaging buildings and roads. Studies have shown that a 1cm section of rhizome can produce a new plant in 10 days. Rhizome segments can remain dormant in soil for twenty years before producing new plants. If you have Japanese knotweed on your land you may be causing a private nuisance to surrounding properties. Using our guidance you should control the Japanese knotweed to prevent further spreading. If Japanese knotweed on a neighbouring property is causing a nuisance to you, we would always recommend that you co-operate with the landowner and seek to control the problem amicably, rather than resort to legal action. This is an issue under Common Law and the Environment Agency has no powers in this situation. The Wildlife and Countryside Act 1981 states that it is an offence to “plant or otherwise cause to grow in the wild” any plant listed in Schedule nine, Part II of the Act. This lists over 30 plants including Japanese knotweed, giant hogweed and parrot’s feather. Save a fortune in replacement costs by letting us revive old patios, driveways and decking with our professional Pressure Cleaning, Sealing & Sanding services.